"Where were you the day Disney World was bombed?" When I opened the book to its first page, I remember posting a snapshot of the first line to Instagram. My entire account blew up after that! People were messaging me left and right, asking me what book I was reading. Such a powerful powerful first line that immediately sparked a conversation. Transcendent is unlike any book I've ever read before. If you recall, I had previously read and loved Katelyn's debut novel, Immaculate. I can also remember saying the same thing about her first novel but, oh man. From poignant writing to well-melded character relationships, this is one book you won't be able to forget. When Disney World is bombed, the world is in pieces. Suddenly what seems like a miracle in a time of grief and chaos, comes in the form of a seventeen-year-old girl named Iris Spero. Iris is just an ordinary teenager living an ordinary life, that is until a stranger knocks on her door telling her that she might be the key to healing the world. Iris' whole world turns upside down after that. It seems as if the people closest to her have been keeping secrets and Iris' destiny might not just be to get into a good college and graduate. There could be something more. Something... magical? Terrorism, yikes. I'll admit that when I first read the synopsis for this book I was pretty hesitant to pick it up. Then I remembered how much I enjoyed the author's first book and persevered. Terrorism is a very touchy (for a lack of a better term) subject. I don't like talking about the role terrorism has had in our contemporary world just as much as the next person. It was very brave of the author to bring her story into the YA genre. Let me say, she handled the topic really well! Disney World is a symbol of innocence, joy and even nostalgia. Detweiler took something as iconic as Disney World and immersed her readers into an alternate universe where the possibility of Disney World being bombed was real and vivid. She is able to start a conversation. What if terrorists really bombed Disney World? Is it a safe place to be anymore? Who would ever do such a thing? It's hard to find hope when something as tragic happens. But you see for Iris Spero, she is told that she could be the key to healing the world. How does a 17-year-old react to something like that? Well, just as you'd expect one to. Iris thought that all she'd ever been born to do was graduate high school, go to college and take on a steady-paying job. Little did show know that she was about to become a symbol of hope, courage and forgiveness. And at that time, the world needed something to believe in, some miracle to hold on to. The world thought Iris to be that miracle not necessarily because they thought a 17-year-old girl had the power to change the world, but because they were desperate for some semblance of hope.In the beginning, Iris questions the validity of the stranger's accusations. She questions herself. Along with the rest of the world, Iris has just about lost all hope. My only qualm was that I would have loved to see more of Iris Spero's character development. As to not spoil the masses, I'll only say that Iris' coming to terms with herself didn't really please me to the certain extent that I thought it would. For Iris, it was more of a 'hey the world believes I can help, let's get it over with and give people some hope' rather than her actually believing that her existence itself might cause people to be hopeful. Soon after finishing the book, I had to take a big step back. It's not everyday that you read something so powerful that it shakes the very core of your beliefs. This book is not intended to be a direct sequel to Immaculate. However, after reading both books I do think it is BETTER to go into this one having read her first book. That's just my opinion because characters from Immaculate do appear in Transcendent. The author has stated that you do not have to read Immaculate to read Transcendent (but you should haha). Transcendent is a dip into the dark and hushed places of Young Adult literature. This book will challenge your outlook on the world and on yourself. I had the oppurtunity to ask the wonderful author some questions about her second publication. If you missed my last interview with Katelyn and review of Immaculate, check it out here! These are definitely some questions you will want to stay for! Like always, you don't have to read the book to read the questions. There are no spoilers. 1. 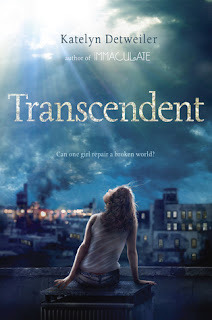 Transcendent follows Iris Spero as she is coming into her destiny in an age of terrorism. Terrorism is a very prevalent issue in the contemporary world, yet Young Adult books often stray from the topic. Was writing your story in an age of terrorism and chaos ever scary or overwhelming? During your writing process, did you ever take a step back and say "is it safe to be writing about this"? This book was definitely not always an easy one to write. But I never considered the option of not writing it. I knew from the beginning that my story needed to start with an unprecedented tragedy, a state of international heartbreak and desperation so raw that the world would be at a total loss for what next—looking to anything, anyone, to bring stability or clarity or hope. I knew, too, that my mind would have to go to dark places, that things had to get worse before they could get better. But it felt necessary to me, starting these conversations—and it feels more necessary, more relevant today than ever. 2. A huge theme in this book is learning to embrace the path God has paved for you. Everyone has a role in the world, whether they like it or not. Growing up, did you always know where you'd end up as you got older? Did you ever think/suspect you were going to be a published author? I thought a lot of things growing up—like yeah, maybe I’d be a writer… or maybe I’d be a princess, an actress, a singer, a farmer… etc. So writer was on the list, but it was a pretty long list. By the time I graduated high school, I’d narrowed it down to journalism, because it seemed like the practical thing to do with my love of reading and writing. Turns out, I hated journalism (and newspapers), so I ended up in English after all. I was lucky enough to land an internship at the university press, and from there it was NYC and a job in marketing at Mac Kids, and now as a literary agent. The author part came after all of that. It was a grand dream that I didn’t necessarily expect to come true… and some days I still can’t believe that it did. Whether it was God or some other higher being or force, fate, destiny—I feel like I’m exactly where I’m meant to be. 3. In light of the Disney World terrorist attack, the world is desperate for some sort of miracle. The world believes that Iris is that miracle! In Iris' situation, would you gladly accept that fate? Oh my goodness, *definitely* not! I’d be way too terrified and insecure to step right up to the plate. Me? A savior? I’m no one special. No better or stronger or more capable than so many other people in this world. Really, though, I’d be super suspicious of anyone who immediately thought they were worthy of the task—that would require a pretty scary level of egocentrism. 4. In my last interview with you about Immaculate, I asked you about the media's role in your book. Yet again, the media has seemed to cause a huge climax in the story. What is your opinion on the role of the media in today's society? Did your opinion inspire their role in your books? The media is scary. So darn scary. We’re seeing that now more than ever. Our perception of current events—of our world—is so heavily influenced by the speed of news, the internet and social media generally, the constant demand for fresh, compelling content; it’s an endless cycle. Half truths and blatant lies can spread like wildfire. We have to be careful, always, about who to believe. Far too many undeserving people are empowered. I think it sometimes takes stepping *out* of our reality—our day to day—into literature (or movies, TV, etc.) to fully process our thoughts, to make sense of how we feel, who we really want to be. oh wow, I think I have Immaculate on my wishlist. and with this book out, I think I should go buy both of them, sit down, and read. I love magical realism, and the idea of Disneyland being hit by a terrorist attack is interesting. I agree that it's a symbol of innocence and that makes me feel like the author really thought about the themes in this novel. I'll take your advice and add Immaculate to my to-read list as well as this book.